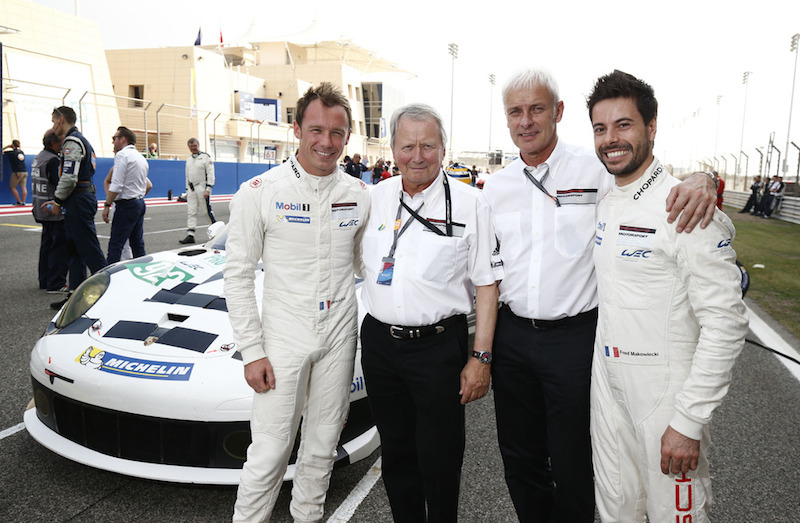 In the number 91 Porsche Team Manthey 911 RSR, Porsche works drivers Jörg Bergmeister and Richard Lietz scored fourth place in the highly competitive GTE-Pro class at the penultimate round of the season in the Kingdom of Bahrain at the Persian Gulf. Their factory pilot colleagues, and Shanghai winners, Frédéric Makowiecki and Patrick Pilet saw the flag in fifth at the wheel of the number 92 vehicle. A full gallery of images at the end of the race report. It was already clear in qualifying that the Porsche 911 RSR would face a difficult race in the hot and humid weather conditions on the 5.407 kilometer Grand Prix circuit outside the capital of Manama. For this reason, the Porsche Manthey squad decided to go with a different strategy than their opposition. During the early first safety car phase, the two works vehicles were called into the pits for servicing, while the competition stayed out on the track. At first it seemed as if this strategy would work: After the first hour of racing, Richard Lietz was running at the head of the GT field with Frédéric Makowiecki close behind in second place. Then, at the 2.15-hour mark, Jörg Bergmeister was leading in the number 91 Porsche 911 RSR. Halfway through the race, when the Bahrain International Circuit was already in darkness, his teammate Richard Lietz was back at the front. This was to be the last time in the lead for a Porsche 911 RSR on this day. The hopes of the strategists behind the pit wall that this rhythm would continue and a quick splash-and-dash refueling stop shortly before the end of the race would be enough to salvage a top placing were dashed due to the unusually low number of yellow flags. Before his final pit stop, at the beginning of the sixth race hour, Richard Lietz was on course for a podium spot in third place. Jörg Bergmeister took the wheel the car for the last stint, which had fallen back to fourth after the last stop, and launched an attack on the Ferrari in front of him. Ultimately he missed out on a podium result by a little over two seconds after he was significantly hindered by a sports prototype and lost direct contact to the vehicle in front. Porsche Team Manthey had to settle for positions four and five. The final round of the Sports Car World Endurance Championship WEC is held on 30 November in Sao Paulo/Brazil.